In 1959, he immigrated to the U.S. in order to study at the University of California, Los Angeles. Eventually, he moved on to the University of Washington, where he earned a Ph.D. in chemistry and learned to love Seattle, which he came to know as home. In Seattle, he met his wife and had a daughter, working as a professor of oceanography at UW for seven years. After that, Pavlou went into the private sector, serving as an environmental consultant. After 18 years of marriage, he and his wife divorced. But Pavlou started a new phase of his life when he met Diane. Sadly, her life ended early in 2002 at the age of 47 due to lung cancer. Diane and Pavlou spent 15 years together, and the grief of losing her took years to overcome. Pavlou’s life took another dramatic turn when he had a hemorrhagic stroke, which placed him in rehabilitative therapy for six months. But he eventually found new love in a woman named Laura, who would go on to be his wife and help him regain his strength after the stroke. Pavlou spent five years writing his memoirs, which are abundant with heart-warming memories of his family, accounts of lost love and intriguing wartime stories. When Pavlou set out to publish the 172-page book in March 2014, now residing at an Aegis Living community in Seattle, he chose Seattle Publishing to help with the layout, design and printing of the autobiography. Today, the publication is on display at the Aegis on Madisongift shop. 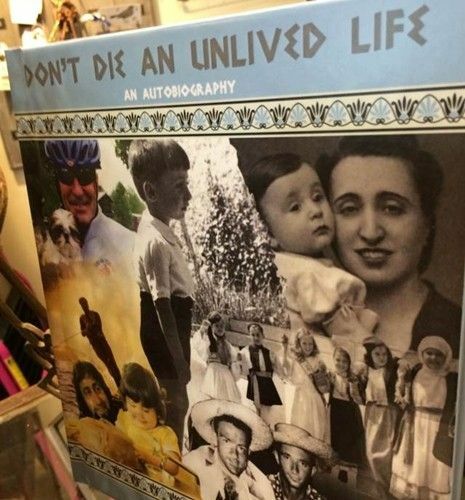 He has even used the book to inspire others to find direction and produce something life affirming – Pavlou has given book presentations to the memory care group and is looking to have “Don’t Die an Unlived Life” sold at other venues. As an Aegis Living resident, Pavlou is encouraged on a daily basis to take on new activities, pursue hobbies and seek out a sense of purpose in order to find fulfillment in his senior years. This is true of all Aegis seniors, as the assisted living leader knows the importance of maintaining ambition in life for the betterment of both satisfaction with life and mental health. In fact, a study by scientists at the Rush University Medical Center proved that a sense of life purpose may guard the brain against changes related to Alzheimer’s. “Our study showed that people who reported greater purpose in life exhibited better cognition than those with less purpose in life even as plaques and tangles accumulated in their brains,” lead researcher Dr. Patricia A. Boyle said in a statement. Seniors who have hobbies, interests and a general sense of purpose in life are less prone to isolation and the negative feelings that come with loneliness, as such activities are typically social in nature. Writing, as in Pavlou’s case, is often considered a solitary labor of love, but by sharing his work with others in the assisted living community, the author has made it a collective activity and served as an inspiration for others to become creators in their own rights and figure out what’s important to them. Promoting a sense of purpose is an integral part of the Aegis care plan, and there are many other ways in which Aegis communities help people pursue their interests. Aegis on Madison has its own Blanket Club, in which members use their knitting skills to make blankets and then donate those blankets to people in need. Initiatives like these are all part of the Life Enrichment program implemented at all of the Aegis communities. As Aegis on Madison’s assistant Life Enrichment director Curtis Knopf discussed in an August 2014 interview, the main goal of the Life Enrichment program at Aegis Living is to help seniors stay mentally and physically active and, most importantly, to find purpose in the later years of life.